This free 4-day course provides hands-on training on the fabrication and characterization of diffused junction and silicon heterojunction solar cells. The course will begin with 156 mm solar wafers and end with full modules. Safety training will be provided on October 30. 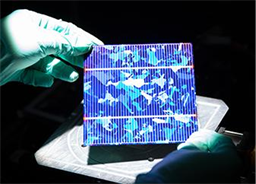 Lab work focused on the fabrication and characterization of solar cells using an industry standard pilot line, under the guidance of PV experts, will take place from October 31 through November 2. Please note: the course is free of charge. However, course attendees are responsible for their own travel and accommodation while attending the course in Tempe, AZ. For further information, please email Som Dahal (sdahal@asu.edu), Stuart Bowden (sgbowden@asu.edu), or Trevor Thornton (t.thornton@asu.edu).